When a Storm occurs in your area it is important to check your Crawl Space. You never know if standing water is present. If left untreated it can cause serious secondary damages. This Home in San Mateo County had Mold Damage. 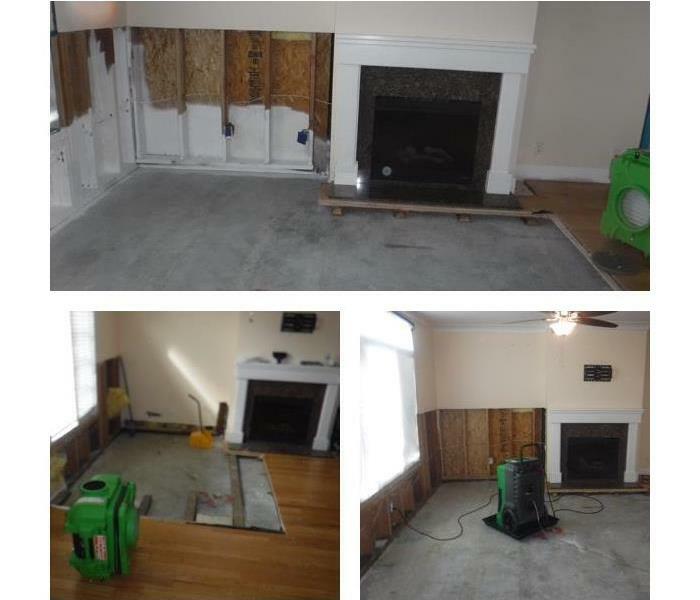 SERVPRO of South San Francisco City/ San Bruno was contacted to properly Remediate the Location. We removed all affected materials, cleaned, sanitized and dried the location. This Apartment Building in San Mateo County had a Fire Loss. When a Fire Occurs there is always Water involved. 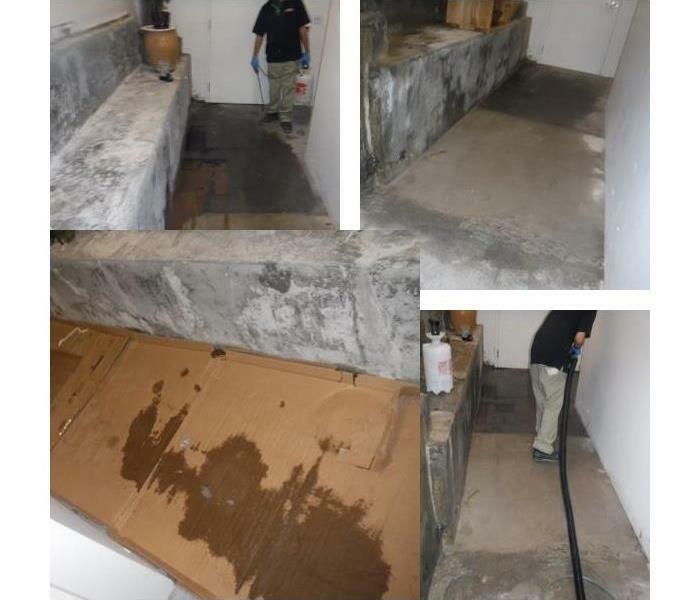 SERVPRO of South San Francisco City/ San Bruno was able to extract all the standing water left before secondary damages could occur. This Retail Building in San Francisco had water come in after a storm passed. SERVPRO of South San Francisco City/ San Bruno was able to get onsite to clean up the mess quickly, so business could stay open. This Bathroom looks perfect from the outside, but what's between the walls? 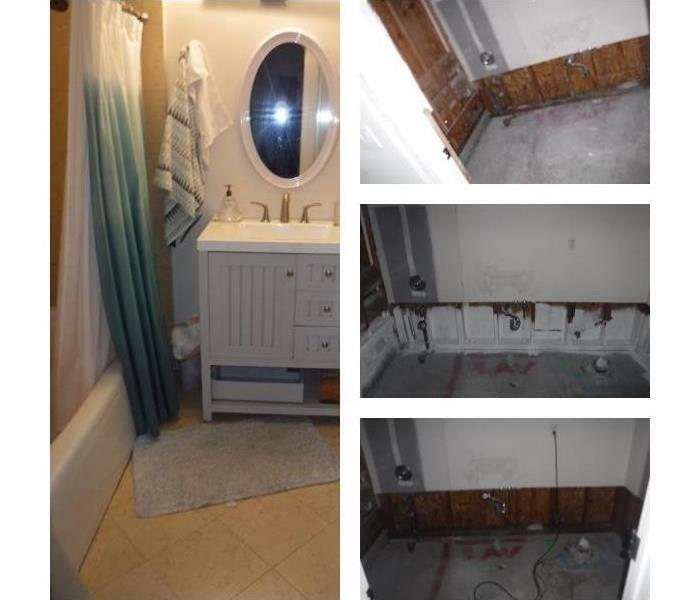 SERVPRO of South San Francisco City/ San Bruno performed Mold Remediation to this Bathroom. We had to remove the Bathroom Fixtures in order to get the Job done correctly. A Roof Top Fire Loss in a San Francisco Building also causes Water Damage. When the Fire was put out all that water came in and affected the Hardwood Floors. 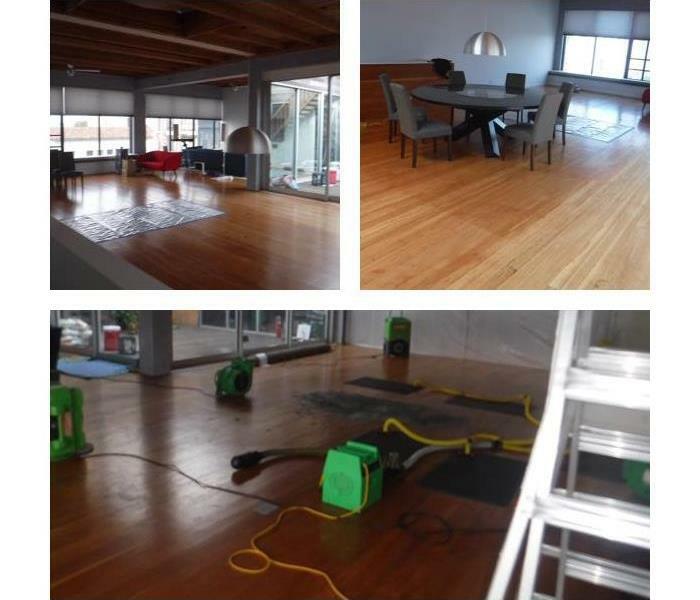 SERVPRO of South San Francisco City/ San Bruno not only cleaned the mess but was able to save the Hardwood Floors. 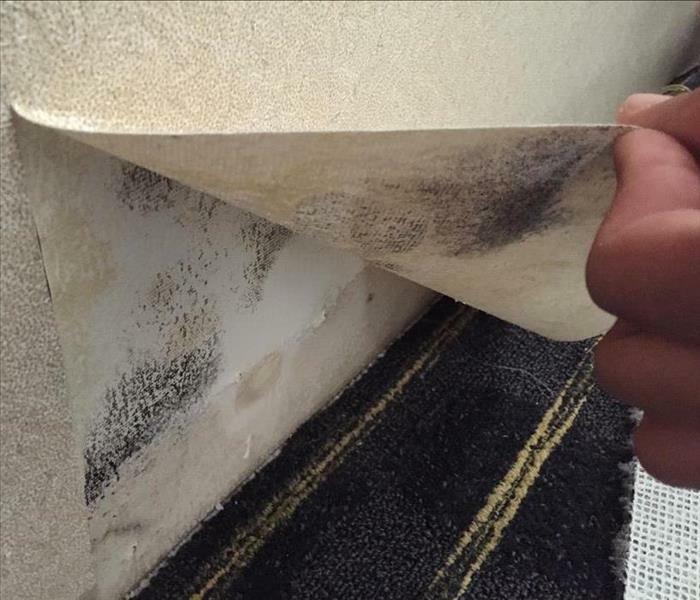 During Water Mitigation at a Commercial Office in Millbrae, CA SERVPRO of South San Francisco City/ San Bruno found Mold behind Wallpaper. The Office had a reoccurring leak which caused the Mold to grow. No matter the Size of your Water Damage we at SERVPRO of South San Francisco City/ San Bruno are always ready to assist in your time of need. We are faster to any size disaster! Just because a Ceiling looks like their is no damage doesn't mean there is none. This Residential Home in Burlingame, CA had Water Damage from above. Luckily, SERVPRO of South San Francisco City/ San Bruno was called out to Inspect. The entire ceiling cavity with Insulation was completely saturated with water. This Bathroom in a Residential Home in San Bruno, CA had Mold hidden behind the Vanity. SERVPRO of South San Francisco City/ San Bruno was called out to inspect the location for Water Damage and during that inspection we found Visible Growth. 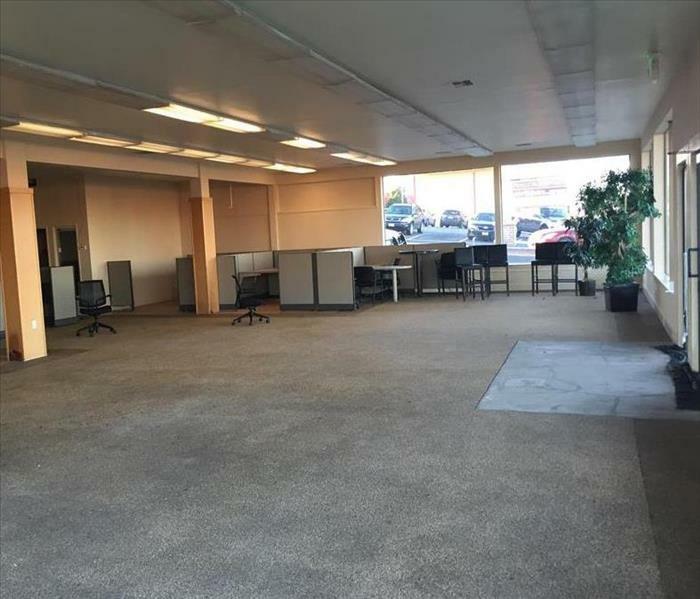 This Commercial Office in San Bruno, CA was affected by Water during a Storm. The Office was completely filled with Water. 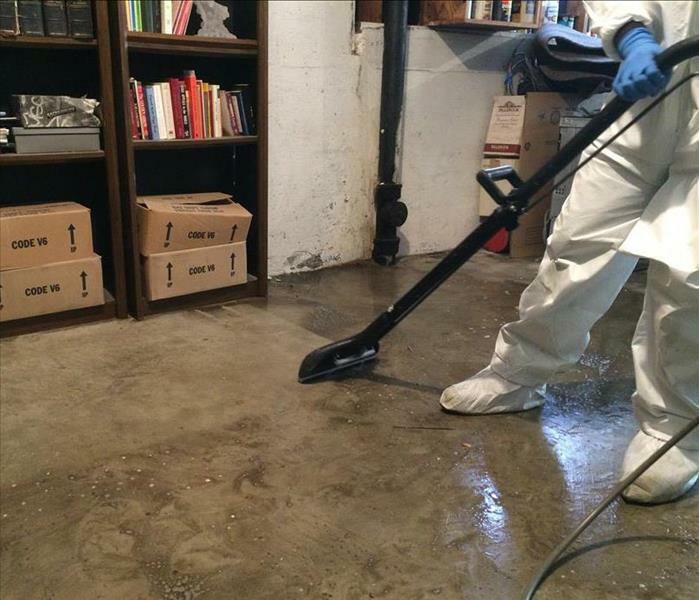 SERVPRO of South San Francisco City/ San Bruno was called to perform the Water Mitigation. 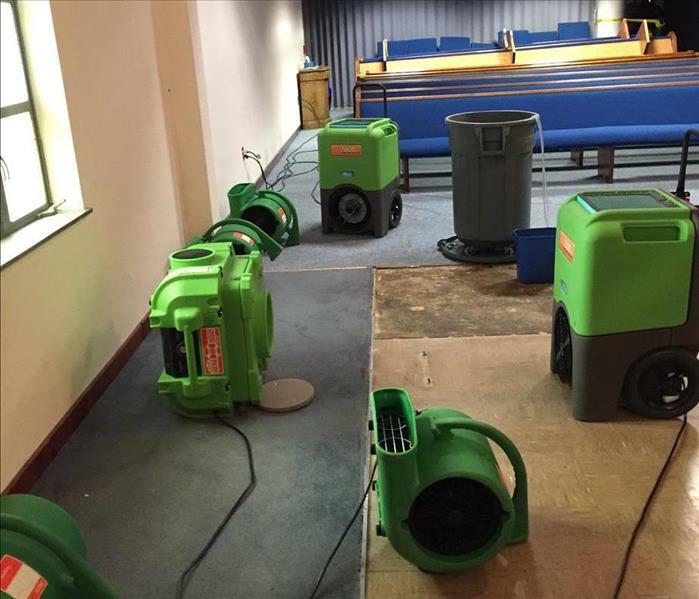 A Church in San Francisco required Drying Mitigation due to a Water Loss. SERVPRO of South San Francisco City/ San Bruno arrived with the necessary equipment to dry the Structure within the Chapel Room. This Basement was full of water from a Storm in San Mateo County. 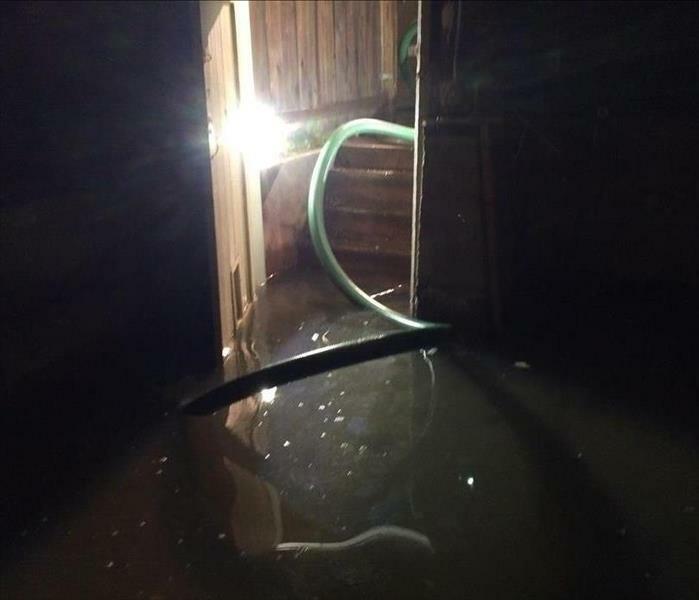 There was Flash Flooding in the neighborhood which caused this Basement to fill up quickly. Luckily SERVPRO of South San Francisco City/ San Bruno was called to extract the water out. SERVPRO of South San Francisco City/ San Bruno is ready and equipped. Our Technicians unloaded the required Drying Equipment for this Water Loss in San Bruno, CA. You can never have to much Equipment on hand! SERVPRO of South San Francisco City/ San Bruno saves Hardwood Floors in South San Francisco! When it comes to Restoring vs Replacing our Technicians will favor the restoring side and give it our all to succeed. This Residential Home had a Flash Flood Occur during a Storm in San Mateo County. SERVPRO of South San Francisco City/ San Bruno was called out to help clean up the mess. SERVPRO of South San Francisco City/ San Bruno responded to a Commercial Building Emergency Service in Brisbane, CA. Our Technicians arrived quickly Onsite to access the Damage. We are always ready to help assist in any situation! SERVPRO of South San Francisco City/ San Bruno was called out by an Insurance Company to perform Fire Damage Restoration in San Francisco, CA. A Fire started from the Embers of a Fireplace in this residential home. A huge hole was left in the middle of this Living Room. The Carpet and Hardwood Floors Burned and Soot was all over the Home and Contents. All the Affected Carpet and Hardwood Flooring had to be removed. The hole that was left by the Fire was covered up to prevent any accidents from occurring. The Whole House was cleaned along with all the Contents. SERVPRO of South San Francisco City/ San Bruno performs Mold Remediation in Pacifica, CA. 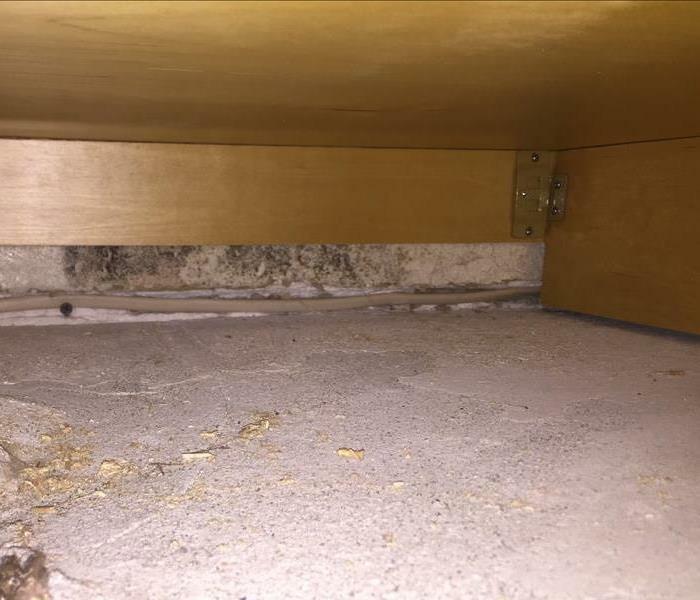 This residential home had a previous water leak that occurred in their Kitchen, but due to the lapse of time that Water Loss became a Mold Loss. The Mold was found between the Cabinets and Drywall. To properly perform the Mold Remediation in this Kitchen the affected Non- Salvageable Lower Cabinets had to be removed. We wanted to keep this Kitchen Operable for our Customer, so we were able to temporally save the Counter Tops by propping them up. The Mold and affected materials was removed. The Mold Remediation was successfully completed and the Customer was very happy with our services. 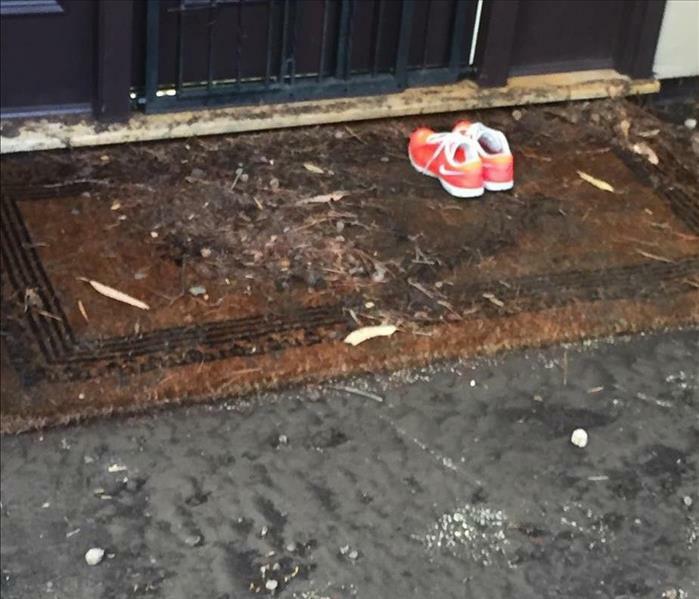 A Salon in Brisbane, CA had Water Damage caused by a Fire Hydrant. The Water from the Fire Hydrant gushed in affecting the Ceiling, Walls and Flooring. SERVPRO of South San Francisco City/ San Bruno was called to perform the Water Mitigation in this Commercial Building. Unfortunately due to lapse of time the affected materials could not be dried and saved. 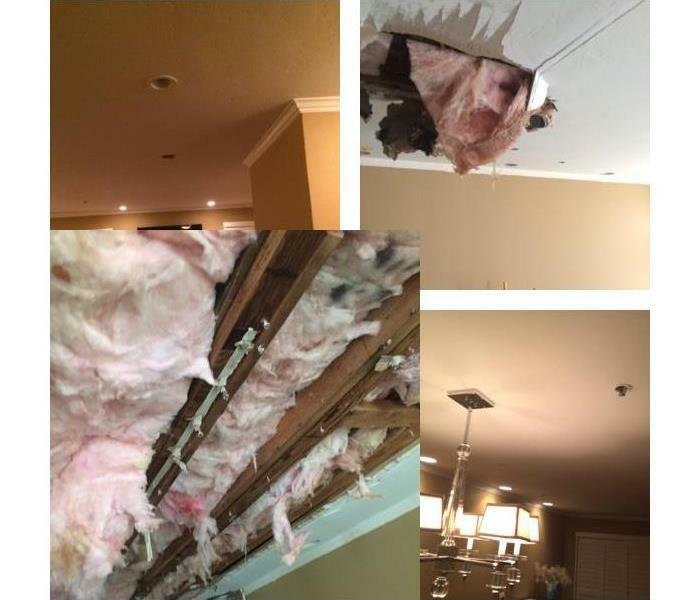 The affected Drywall, Insulation and Hardwood Floors had to be removed in order to stop the secondary damages that occurred. A Dehumidifier and an Air Scrubber was placed to dry the exposed wood framing. Once the Drying Completed and the Equipment was removed the Salon was able to rebuild to get their business back up and running. This Loss occurred from a Toilet Supply Line Failure in South San Francisco, CA. The Water ran all night affecting the entire home. In this Photo we are Extracting Standing Water from Non-Salvageable Carpet and Pad. We are also removing the Carpet and Pad as we go. The Carpet and Pad was beyond its Drying point and could not be saved. This Kitchen in San Francisco, CA had Water Damage caused by a Roof Leak. Due to the Lapse of Time in performing any Water Mitigation Services Demolition was required. 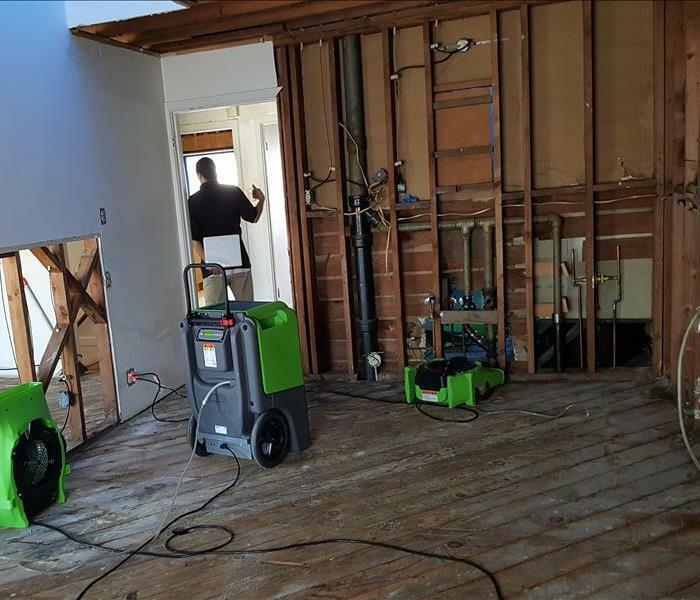 SERVPRO of South San Francisco City/ San Bruno placed Drying Equipment after the Demolition to dry the Exposed Wood Framing. This Residential Home in San Bruno, CA had a Water Loss and SERVPRO of South San Francisco City/ San Bruno was contacted to perform the Water Mitigation Services. In this Photo we found Hardwood Floors under the Wet Carpet and Pad. Unfortunately, in this situation, due to the lapse of time, the hardwood floors could not be saved. It is very important to Mitigate Water Damage right away to prevent secondary damages from occurring. This Hospital had Water Damage in South San Francisco, CA. Sometimes affected materials have to be removed to save other parts of the structure. In this case drywall was removed from one wall to save the tile wall enclosure in the Bathroom Area. SERVPRO of South San Francisco City/ San Bruno performs Upholstery Cleaning to two Chairs after a Fire in the San Francisco County. The Chairs had Heavily Smoke and Soot Damage, but our Technicians know how to get the job done right! The results speak for themselves. 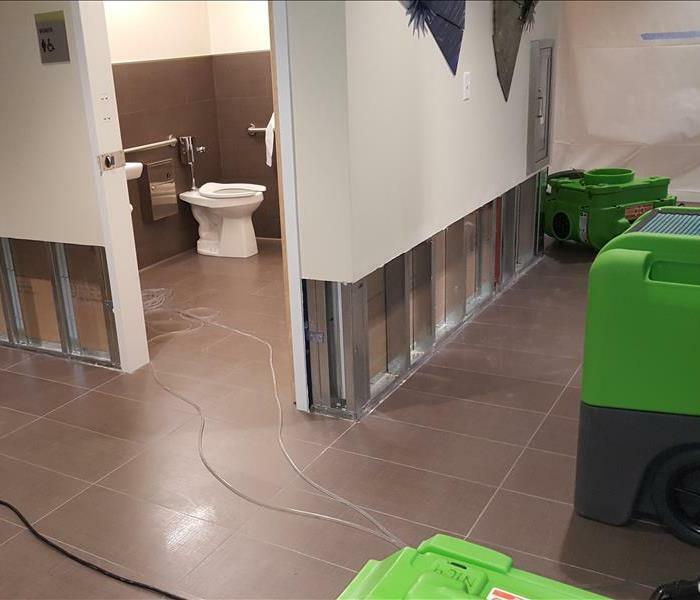 SERVPRO of South San Francisco City/ San Bruno builds a Containment in a Commercial Building due to Water Damage in South San Francisco, CA. Containment's are built for different situations. This Containment was built to create a Drying Chamber. The Drying Chamber surrounds and contains the Water Damaged Areas, so Drying Equipment can do its work! SERVPRO of South San Francisco City/ San Bruno was contacted for a Residential Water Loss in San Bruno, CA. The Tile Flooring in the Bathroom was affected by the Water. Unfortunately due to the Bathroom having a Wood- Sub Floor the Tile Flooring had to be removed. It is very important to make sure any Wood Sub Floor is dried properly to prevent secondary damages from occurring. A Residential Water Loss in San Bruno, CA. This Loss occurred by a Toilet overflow. This was a Black Water Loss that required Extraction, Pressure Washing and an Application of Antimicrobial in a Garage. Our Technicians at SERVPRO of South San Francisco City/ San Bruno are always prepared. SERVPRO of South San Francisco City/ San Bruno was contacted for an Emergency Service Board Up in South San Francisco, CA. 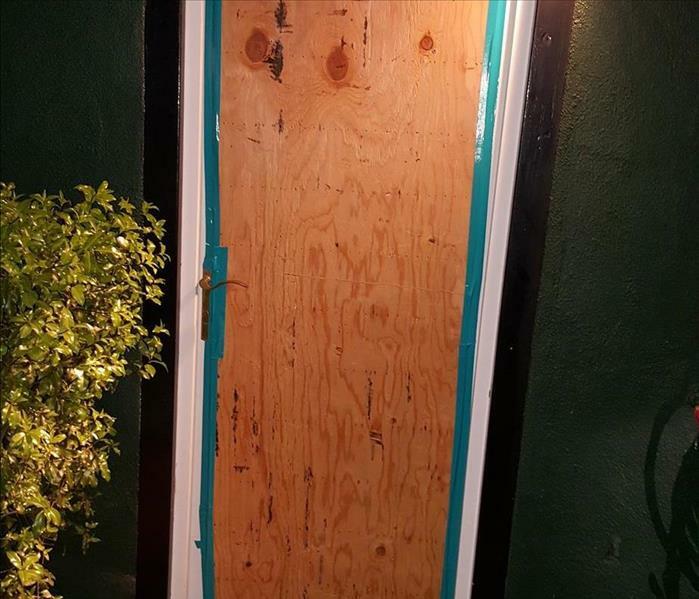 A Glass Door was broken into and required immediate attention. Our Technicians are always ready to help assist in Emergency Situations. SERVPRO of South San Francisco City/ San Bruno was contacted for a Commercial Building Water Loss in South San Francisco, CA. The Water affected the Drywall and Insulation. Due to the wet insulation the drywall required removal. Unfortunately Wet Insulation cannot be dried. Once Insulation is saturated by water it is non-salvageable and must be removed. SERVPRO of South San Francisco City/ San Bruno was contacted for Smoke and Soot Odor in a Commercial Building in San Francisco, CA. A Hydroxyl Generator was placed in that Building. The Hydroxyl Generator Deodorizes and decontaminates with no added chemicals. In this situation the Movie Theater had a Smoke Smell due to a neighboring Fire Loss. Our Owner/ Operator of SERVPRO of South San Francisco City/ San Bruno even works Hard! Shawn is cleaning a Sewage Loss that occurred in a Commercial Buildings Garage Port in San Mateo, CA. In this Photo our Technicians are getting ready to perform Mold Remediation in San Francisco, CA. Our Technicians at SERVPRO of South San Francisco City/ San Bruno are suiting up with PPE and getting ready to remediate! 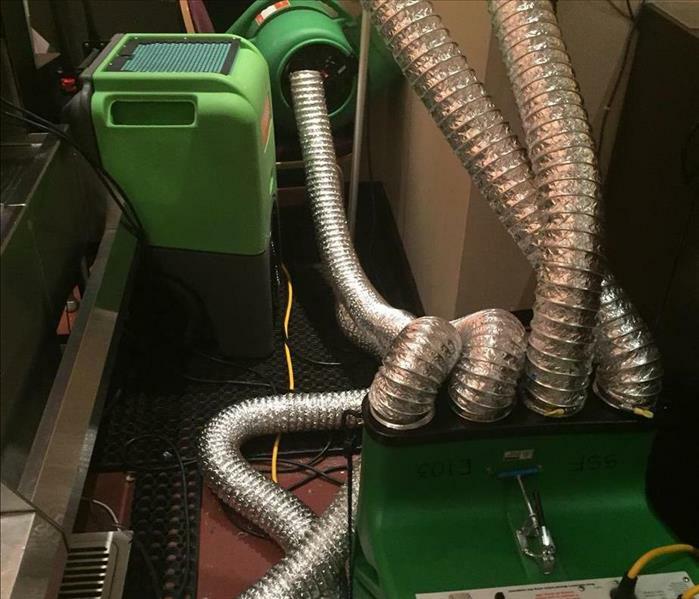 This Hydroxyl and Air Scrubber was set up to deplete a strong odor in San Francisco, CA. The Hydroxyl uses UVA Rays and provides the safest way to eliminate odors with no added chemicals. The Air Scrubber is used for cleaning and controlling the air quality. The Clean Air is returned to the Environment. This O'Zone Generator was placed to eliminate a nicotine odor in Burlinagme, CA. The O'Zone Generator attacks odors at its source to permanently remove the odors in the treatment area. In this Photo our Technician Cole is removing Bagged Debris from a Fire Loss in San Francisco, CA. Cole always has a positive attitude! Actually all of our Technicians at SERVPRO of South San Francisco City/ San Bruno have Positive Attitudes! In this Photo James is sketching the dimensions of the entire structure for a Fire Loss that occurred in San Francisco, CA. SERVPRO of South San Francisco City/ San Bruno always pays attention to detail! An E-Tes Unit was placed in a Kitchen to Dry a Tile Wall in San Francisco, CA. The Special E-Tes Unit also known as the Thermal Heat Drying System, assists in Structural Drying to help evaporate moisture faster to prevent removal or secondary damages. 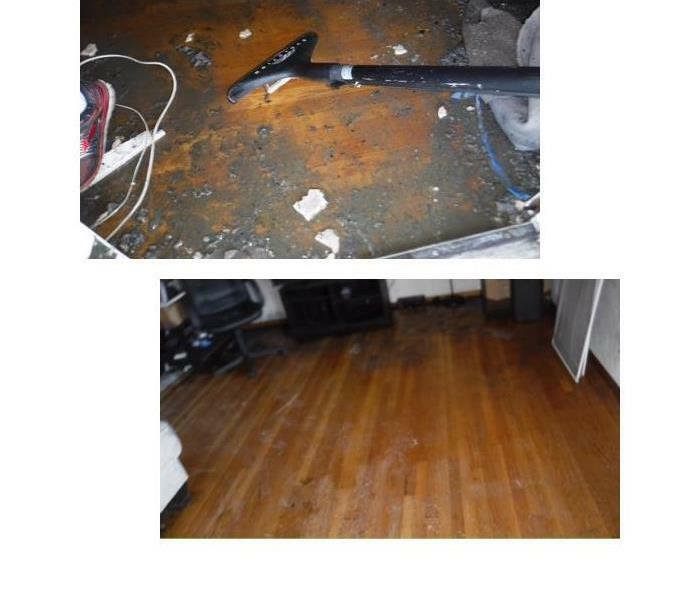 This Water Loss affected beautiful original Hardwood Floors in San Francisco, CA. Drying Equipment was placed to Save the Hardwood Floors. Generally Hardwood Floors takes 5-10 Days to Dry. In this case the Hardwood Floors were saved and took 8 Days to Dry. 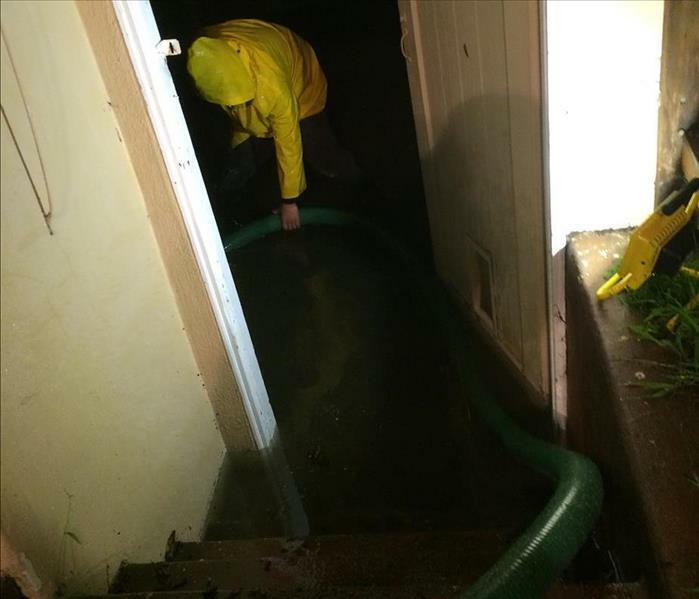 This Basement Flooded due to heavy Rains in San Mateo County, CA. SERVPRO of South San Francisco City/ San Bruno was contacted for Emergency Services. We were more than happy to go onsite to extract all that water and help prevent any secondary damages. This Commercial Building had Water Damage to their concession stands in San Francisco, CA. We arrived onsite and set up our special drying equipment to save the structure from demolition and secondary damages. Our Technicians are Trained to Clean Structures after any Fire Loss in San Francisco, CA. Like in this Photo, we Clean the Debris and Heavy Soot off the Walls to get you back in your Home Quickly.